If you have any questions, you may find the answer you're looking for below. Alternatively, you're more than welcome to call Ben or Sam using the details on our Stonetree contacts page. Q - What happens when I call to arrange a quote? A - We will have a chat about the work that you require, advise on availability and then arrange to come and see your garden to chat further, measure up and take some pictures. We will then provide a comprehensive quote, usually by email. Q - What do I receive when you quote? A - When we quote for work, we provide you with all the information you need to ensure you know exactly what our quote includes, any specifications on the build quality and any assumptions we have made. If appropriate, you'll also receive a sketch to show the landscaping work to be carried out, such as a patio or driveway layout. You'll also receive our Stonetree Client Care Contract document that contains the quote, our terms and conditions and some useful bits of information. Q - What do I do if I just need a Landscape Design? A - Much like quoting for landscaping, we'll arrange a visit to your property. Ben tends to lead the design work so he is the best person to contact for this service. He'll take some pictures, and have a chat with you to fully understand what you are hoping to achieve with your garden. He'll then offer a little advice, and write a design brief based on your discussion. This brief ensures he has interpreted your requirements fully and will be accompanied with a quote for the design work. Once the quote is accepted, Ben drafts up some concept sketch plans, and at least one mood board of pictures, and present these to you. This enables you to pick and choose the best bits from the concepts, which are then combined to form a single master plan with full specifications. Although we would love the opportunity to be part of the build process, this master plan is clear and scaleable, allowing other landscapers to easily quote for the works too. Q - Where do you operate? A - We are based in Melton Mowbray, and generally travel anywhere within a 20 mile radius. To the south, we cover Rutland as far as the north side of Corby, including Market Harborough and Uppingham. To the East, we'll cover as far as the A1 including, Stamford and Grantham. To the North, we'll cover as far as the A52 for the South of Nottinghamshire, including Bingham, Ruddington and West Bridgford. To the West we cover as far as the A6 including Loughborough, Quorn and East of Leicester. Q - What size of projects do you undertake? A - From a shed base or fence to a complete garden makeover. Anything from half a day to several months work. Q - What are your working hours? A - When landscaping, we generally work from 830am to 5pm Mon-Fri, with the occasional early start or late finish if we're really busy. Our initial visits are usually during normal working hours, but we are able to meet up in the evenings or weekends to suit you. Q - Are you insured? A - Yes, we are fully insured for both Employers and Public Liability. 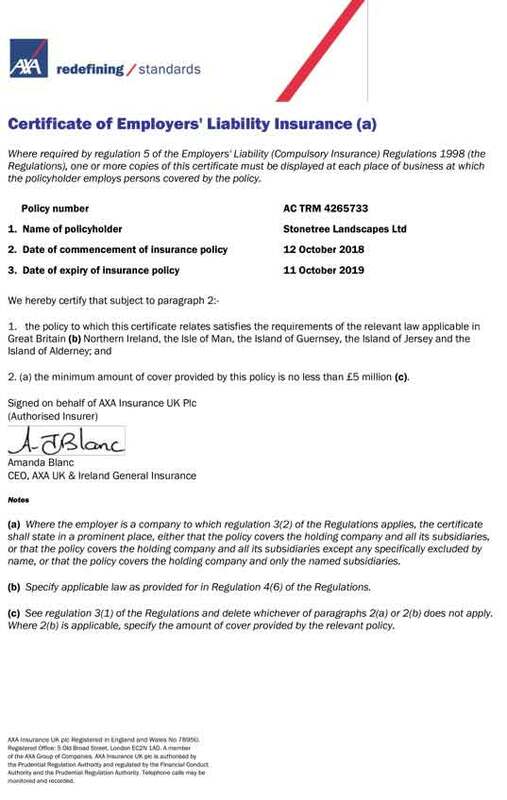 Our current level of insurance for Public Liability is £5m. Click here to see our Employers Liability Insurance Schedule. Q - How do your prices compare to other landscapers? A - Feedback from our clients shows that our quotes are mid-range when compared to other landscaper's quotes. The feedback we receive following our work has always been complimentary, and we enjoy a growing number of repeat customers. We feel that, given the quality of workmanship, the level of service Stonetree offers, and our use of only appropriate and high-quality materials, our prices are competitive. Q - Do you offer warranties? A - Although we offer a service based on years of experience in landscaping and construction, Stonetree is still a newly registered business and we haven't yet been able to set up a warranty service. We do feel this is something that Stonetree needs to formally introduce during 2018 and will strive to do so, as we'd love the opportunity to back up our quality of workmanship in writing. However, up until this point, in the unlikely event that an issue should arise within a reasonable length of time, please give us a call and we will endeavor to rectify any problems. Q - Do you use sub-contractors? A - Sometimes we do use sub-contractors. However, these are from a small number from whom we have worked with before and trust. Furthermore, our sub-contractors are rarely left unsupervised and are almost always accompanied by either Ben or Sam whilst working on our projects. Q - Do you have staff/employees? A - We don't employ staff and will not do so for the foreseeable future. We want to keep a very close eye on our standards, so we took the decision in late 2016 to change our workforce so that the landscaping would only be carried out by us, Ben and Sam. We knew that this would mean we could handle much less projects, but quality is more important to us. Q - Ways to pay?